From publicity to long-term friendship – . ….. . Publicity and marketing is difficult for many artists. First of all it is pretty boring, and it often goes against the modest nature of many, sometimes introverted artists. In the art world it is the case that those who can best sell their story, or best know the way in the funds or subsidy world do the nicest projects. In itself that’s strange, because you would hope that the money givers will also look critically at the content of different projects. I often hear the same complaints from the scientific world. If you can write a good plan and sell that plan well, you will have a greater chance of receiving support from funds than a plan that might better reflect the objectives of the subsidy provider after studying. With this in mind, the members of the reviled Stageband Jazz Orchestra thought they would have to search for their own audience. Of course there are plenty of jazz lovers in the Northern Netherlands who appreciate the efforts and quality of this orchestra on their merits. We have to reach them, get in touch with them, overwhelm them with beautiful projects. If we manage to find enough people that really feel connected to our orchestra, organizing new ambitious concerts will have so many standard preambles that the risk of sticking out our neck will be smaller each time. That is why we play full stops on the publicity organ for our Easter trip. 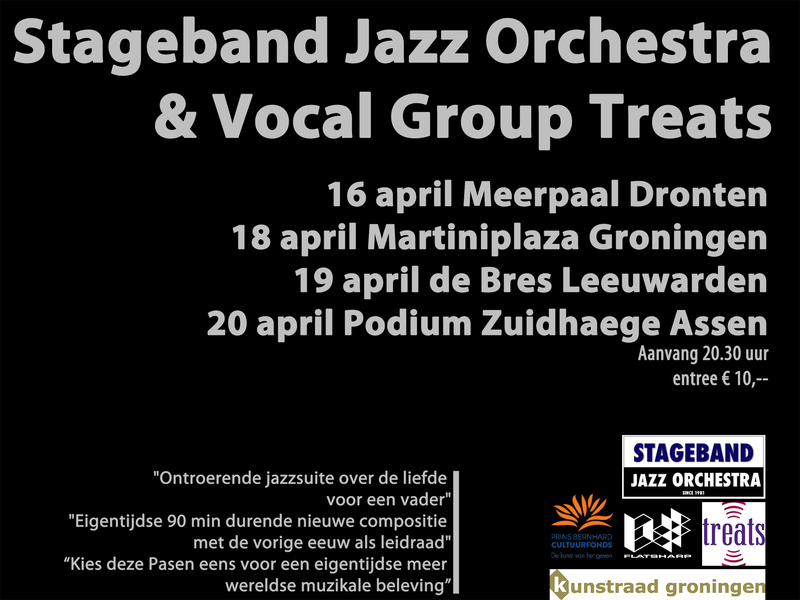 We want to reach all jazz lovers and potential Stageband Jazz Orchestra friends. For hopefully a long lasting friendship.